The second largest marine reserve in the world hosts more than 2,900 species, many of them unique on the planet. 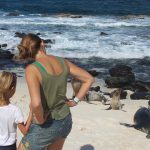 Galapagos Islands are a dream destination for all travelers who love nature. This archipelago is formed by thirteen volcanic islands, located a thousand kilometers west of Ecuador. The Enchanted Islands have a special location due to the confluence of three streams – Humboldt, Cromwell and California -. These streams form a unique microclimate that encourages the presence of an extraordinary variety of endemic and unique species on the planet. 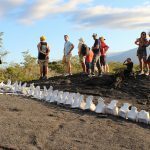 Tourists will be able to swim among large communities of sea lions, blue sharks or sea turtles; walking through lunar-like landscapes with all kinds of iguanas or the mythical Galapagos (giant tortoises), and seeing an infinity of exotic birds such as frigates or blue-footed boobies. The Galapagos are, along with the Andes, the Pacific coast and the Amazon, one of the four natural regions of Ecuador. Galapagos is a magnificent natural place home to unique species in the world. You will be able to see Darwin’s finches, Galapagos mockingbirds, flightless cormorants, Galapagos hawks, Galapagos penguins, Galapagos fur seals, iguanas, and the splendid turtles. We have arranged special itineraries to offer you a lifetime experience at a very affordable price. For further information feel free to communicate with us it will be a huge honor to help you!